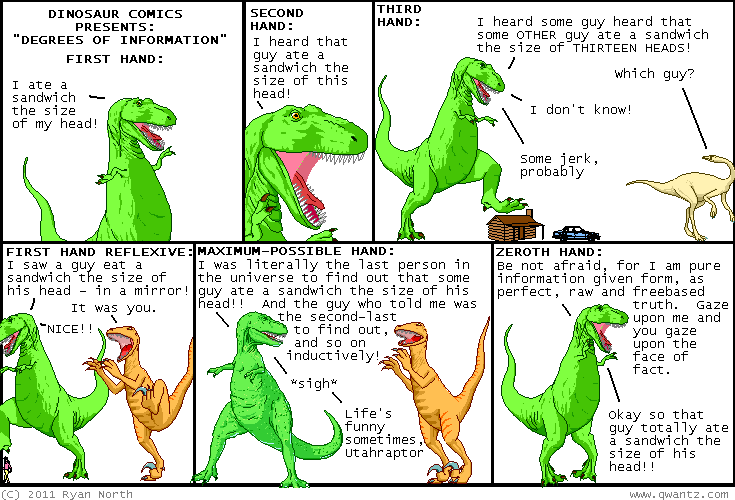 Dinosaur Comics - September 13th, 2011 - awesome fun times! –Everyone agreed that was the case!! September 13th, 2011: My friend Pat (inventor of the chocochop) is doing stand up comedy! He has given me permission to share this PRIVATE VIDEO, which means that you are all now members of an exclusive club. Pat's doing a stand up comedy show in NYC this Saturday, September 17th at 6:30 pm! It's at the Broadway Comedy Club, 318 West 53rd street, NEW YORK CITY. If you go, you should tell the guy at the door that Dinosaur Comics sent you! AND, since I love each and every one of you, the first three people to confirm their attendance with Pat get their name on secret list and get in to the comedy club without paying cover!